A few quick links to today’s news while our picture-a-day countdown helps you remember the good ol’ days. The really, really ol’ days. 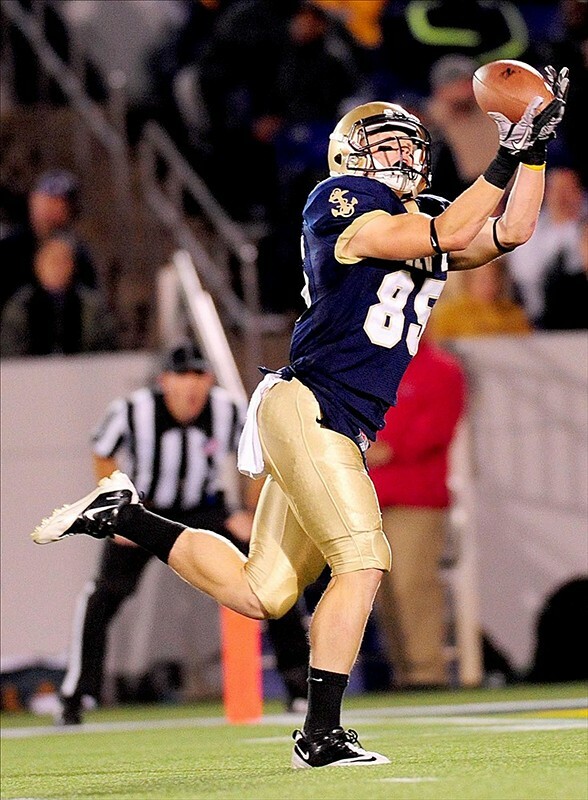 MRI for Navy WR. Junior Matt Aiken was scheduled to have his right knee looked at after injuring it during Saturday’s Blue-Gold scrimmage, The Washington Post reports. Aiken, tops on the depth chart at wideout, was second on the team in both receptions (13) and yards (201) last season. Ahead of him in both categories was fellow wideout Brandon Turner, who’s missing time for a different reason; Turner’s not on the depth chart. Falcons fall silent. What would the Air Force receivers say about the situation at Navy? Good question, but don’t expect an answer — Air Force head coach Troy Calhoun has declared his players off-limits to the media. Frank Schwab of The (Colorado Springs, Colo.) Gazette outlines the situation here, and also relays information on San Diego State head coach Rocky Long’s anti-punting stance. Calhoun is also a fan of going for it on fourth down, Schwab reports, so the Nov. 10 game between the schools could feature few kicks. Get your guide. The Army has released its 2012 media guide. Not your school? Click for Navy and Air Force guides. Breaking Big East news. ESPN reports (and the Navy folks retweet) that the Big East Conference will hire CBS Sports executive Mike Aresco as its new commissioner. Navy will join the conference as a football-only member in 2015. The TV-industry hiring shouldn’t come as a surprise, as negotiations involving the league’s television contract — lifeblood for any modern college conference — will begin Sept. 1. ESPN has exclusive negotiation rights for 60 days, according to the ESPN.com article linked above, which credits the Aresco scoop to ajerseyguy.com. There’s plenty of time to speculate about what this move means for Navy’s future, but it’s worth mentioning Aresco’s CBS holds the current Army-Navy TV contract and will air Navy’s games against Notre Dame and Air Force this season.